As I am preparing several oil-free recipes this month, there are a couple thoughts which come to mind. 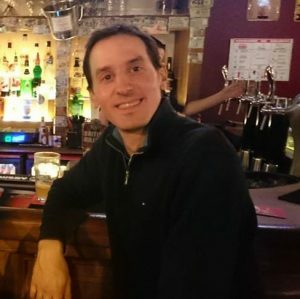 The first is that the brain can be very wired to using certain ingredients, like oils. I grew up on foods cooked in butter, in vegetable oils, in animal fats. Welcome to traditional French cuisine. The flavors can be impressive, but then you end up feeling that if a dish doesn’t have oil it won’t cook well. Can an onion really sear on its own? 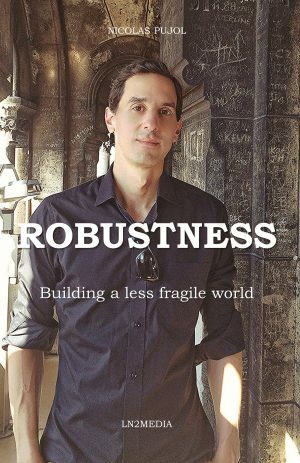 Can a tomato do this as well, oil-free? The second thought is, don’t I need to add some oil to have a complete meal where something isn’t missing? 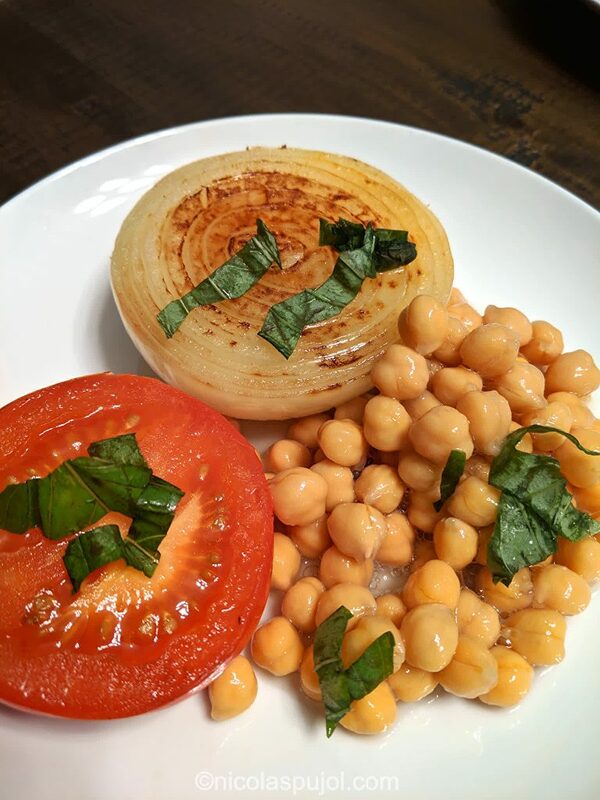 This oil-free steamed tomato, onion with garbanzo beans recipe shows it can be delicious and feel like a complete main dish. The classic seared tomato in French cuisine uses butter or oil, here we only use the water present in the tomato. You can add a few drops of extra water if you feel it is needed. 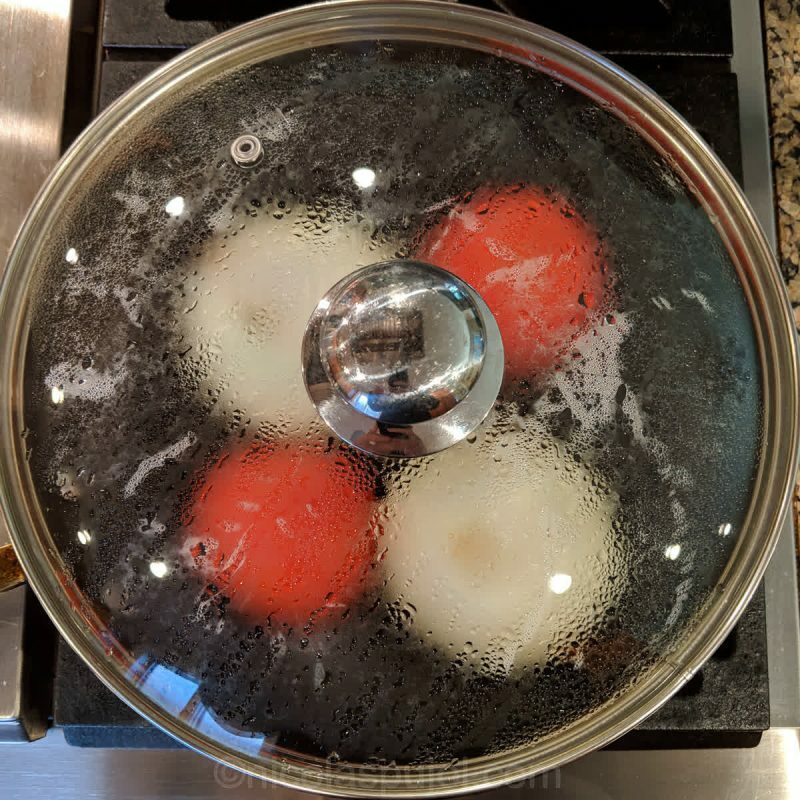 The important steps are to cook on low to medium heat, never too high, and to cover the pan with a lid from the start. This keeps the steam inside, and allows hot air to cook the ingredients from all sides instead of only from the contact points. I love steamed tomatoes. They feel easier to digest, are softer, and give this nice warmth of a cooked dish. Onions, once fully cooked, lose their strong spiciness and become quite mild. It is a matter of patience, well rewarded in the end. 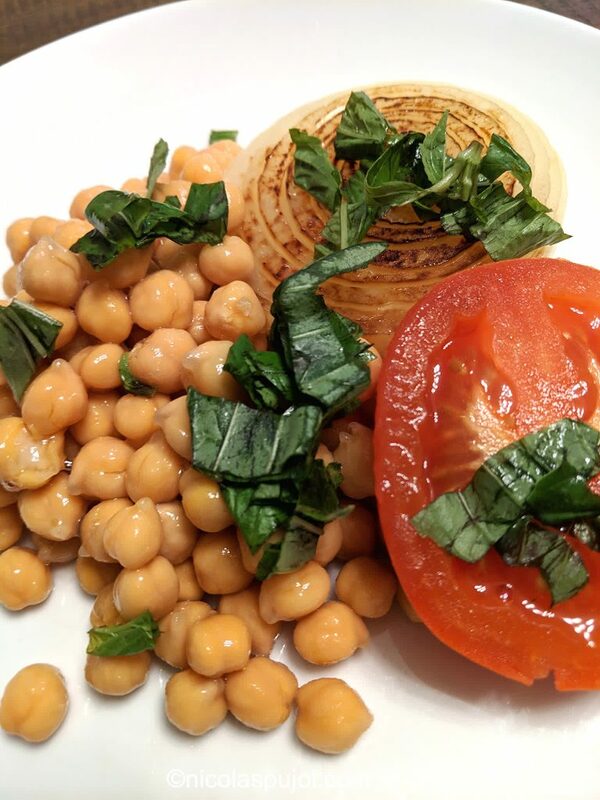 To make the dish satiating, it includes garbanzo beans, all topped with a few leaves of fresh basil. I added hot sauce for extra flavor, it is optional. So is salt. Bon appétit for this whole-food, plant-based, no-oil (WFPBNO) recipe! 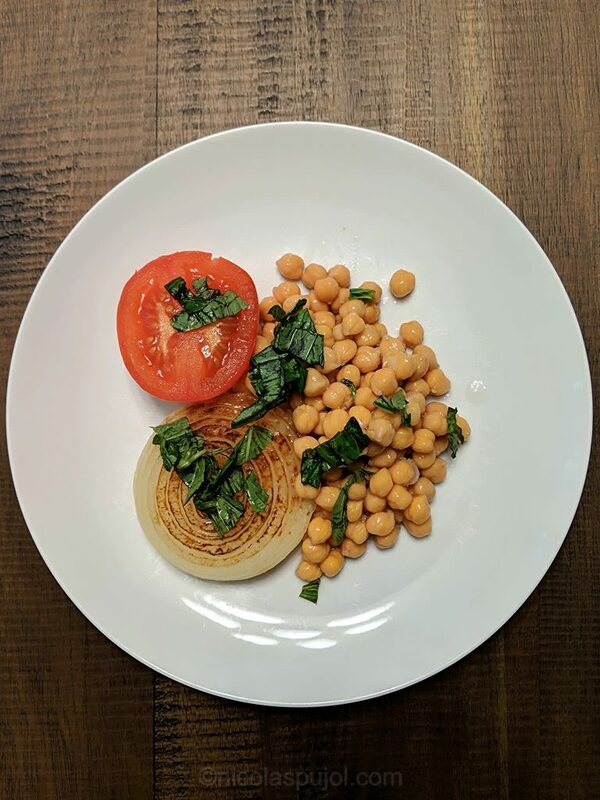 This oil-free steamed tomato, onion with garbanzo beans recipe is a plant-based, whole-foods, no-oil dish topped with hot sauce and fresh basil leaves. Peel the outer skin from the onion, slice it in two. Carve out the small stem fiber from the tomato, then slice in two as well. Heat a pan to medium, place both ingredients on their flat side. Optionally add a few drops of water, then cover with lid. Cook on slow for 10 minutes. 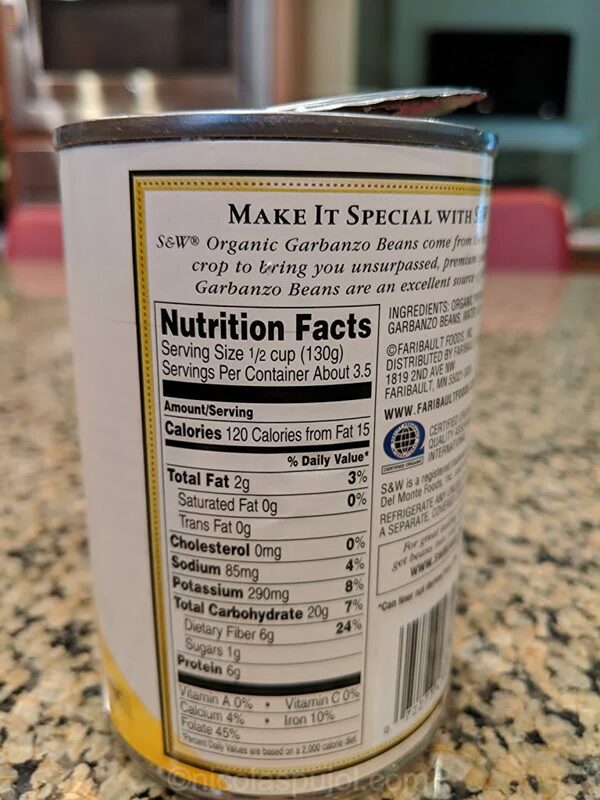 In the meantime, open a can of garbanzo beans, strain them. Finely chop the basil. Turn the tomato and onion slices on their other side, put the lid back on and cook for another 5 minutes until the onion is fully cooked (tender) inside. Add another 5 minutes to extend to 20 minutes total if needed. 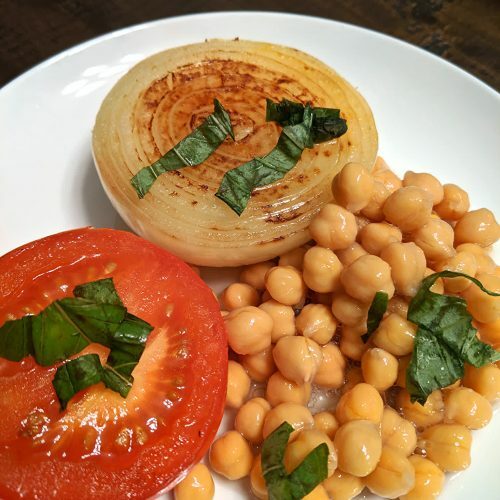 Combine tomato, onion and garbanzo beans on each plate, then sprinkle hot sauce and fresh basil. You may want to keep the liquid from the garbanzo beans when straining them, to make a vegan aioli later if you like it. Vegan aioli tastes delicious, but it does have oil.